There are people you meet once and you know they’ll be here to stay. It’s a gut instinct, a voice in the back of your mind telling you, you’re in for a joyride because this new person’s impact and influence will add to your life something meaningful, something special. One of these people is Kris Tualla. It’s hard to describe what Kris is, but to sum it all it comes down to a wonder woman. What Kris sets her mind to do gets done. And what Kris wants happens. Aside from being a wonder woman Kris is an author. I met her during my first conference this year called Arizona Dreamin’, an event where readers interact with their favorite writers, one on one. The result? Friendships to last a lifetime. Kris is here today for an interview. She also brought a paperback copy of her novel titled A Discreet Gentleman of Matrimony. For your chance to win it leave a comment and your email address at the end of this post. Kris, thank you for stopping by my blog. 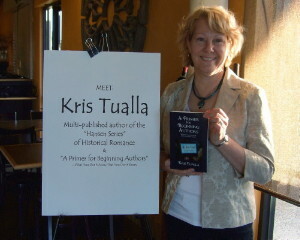 Tell us what’s a day in the life of author Kris Tualla. The rest of my computer time is spent on my laptop where I write all of my fiction. The number of hours I spend on each thing depends on what deadlines are approaching. Funny part is, I can’t switch the computer I do these tasks on because my mind has been trained how to think on each one. I get easily distracted therefore when I write I need complete silence, door closed. The only person allowed in my office is Bella, my dog. When you write do you need complete silence around you or noise? I can write in the midst of chaos as long as the chaos doesn’t interest me. But things like songs with words (I’ll sing along), the Olympics (no explanation needed), or my husband’s channel surfing (what is that show/movie?) do pull my attention from my manuscript. Then I have to shut the office door and focus. I have all these ideas and voices in my head, but for some reason I struggle sometimes to put them on the paper. Do you find yourself at one point or another at a loss for words? Never at a loss for words, but sometimes unsure of the next scene. I write in a straight line, and sometimes I have to step back and ask, “What needs to happen next?” I put myself into my characters’ heads and feel what they are feeling at that point in the story. When I know it, I can write it. How did you celebrate the sale of your first book? That’s an interesting question because I didn’t actually “sell” the first five! I self-published when my agent couldn’t convince traditional publishers to take a chance on my Norwegian heroes. After I fired her and proved myself, Desert Breeze Publishing asked for one of my heroes: Brander Hansen, my deaf “Discreet Gentleman.” They bought five books in his series so far. Um… Uh… Does going out for coffee with friends count? Can I get back to you on that? I’m not identifying myself with any of my characters, yet each one of them has a part of me. Can you see yourself in any of your characters? Which one and why? Every single one of them. My sense of humor comes out, my logical approach to problems, my personal faith in God. They think like I do for the most part. And if they are thinking wrongly about someone or something, I give them a good, believable reason. Even the “bad” characters reflect some of those same qualities, but with devious motives ~ not pure ones! What’s one piece of advice you would give aspiring authors? The single most important thing every author must do (assuming they are actually producing a product, of course) is get feedback from other writing professionals on their work. I’ve seen so many horrific self-publishing examples and it’s clear as glass that those authors never had anyone look at their work. WE CANNOT JUDGE OUR OWN WRITING. Period. What has been the toughest criticism you’ve been given as an author? What has been the best component? The toughest criticism is a comment on Amazon (I know ~ I shouldn’t read them) where a reader gave my book a 1-Star rating because my 1819, logical-like-me, heroine briefly considered raising a child on her own, rather than enter into an uncomfortable marriage. That reader downgraded the entire book based on her five-paragraph inward thought process. REALLY? The best component was RT Book Reviews 4-Star review of my self-published third novel, the last of my Nicolas & Sydney trilogy. WOOT!!! Do you prefer ebooks, paperbacks or hardcover? I prefer to read on my Kindle, no contest. But I do make certain that all of my books are available in print as well because there is definitely a time and place where print books make sense. What projects are you working on and when should we expect another release? In a few words what is this story about. This is the second book in the series and the action immediately follows the first book, “A Discreet Gentleman of Discovery,” where I introduce Brander Hansen, my DEAF private investigator in 1720s Norway. It’s the he-and-she get together launch of the series. The third book, “A Discreet Gentleman of Consequence,” (international money scheme) releases in December 2012. I hope to have both of these books out by February 1, 2013. After that come two more for Desert Breeze in 2013: October’s “A Discreet Gentleman of Intrigue” (a spy story) and December’s “A Discreet Gentleman of Mystery” (dead body in a wall). At that point there will TWELVE books in the Hansen saga.